This week we have new products that are sure to please anyone on your list. Plus check out our roundup of last minute gifts that can be delivered in time. These are unique gift ideas that will truly make the recipient happy and let them know you put thought into their gift! After all it is the thought that counts Right? eGear. Need some juice? Tap the sun with this new product: eGear 5-in-1 solar travel kit. The base stores energy from the sun, and you can use it to power five different attachments: a small LED flashlight, radio, fan, reading light or USB charger. You just choose the component you want, then slide it onto the body until it clicks into place. (Starting at $49.95) Buy eGear's 5 in 1 solar travel kit here. Zip Line Kits. Zip Line Kits include everything you need to set up a flying zip ride across your backyard. Built to last, these heavy duty rides will transform your backyard into a miniature adventure park. All you need is a ladder, a wrench, and a sense of adventure. A great gift for the entire family! (Starting at 59.95) Buy zip line kits for your backyard here. Prep. 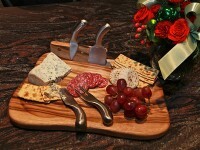 Prep cutting boards and cheese platters are beautifully rustic and thoroughly utilitarian. Each one is handmade in Australia from a solid piece of Camphor Laurel wood that has been air and kiln-dried and sealed with grape seed oil. There’s nothing more to it -- no glues, dyes or anything artificial. These natural wooden cutting boards make the most unique gift ideas for that foodie in your life. (Starting at $34.95) Buy antibacterial wooden cutting boards here. Viva Box. Much more than a gift card. Vivabox is a two-layered gift. Within an elegant gift box package is a sampling within a category (tea, bbq, wine, etc) and then the follow up is a gift card for your recipient to make their own choice within that category. 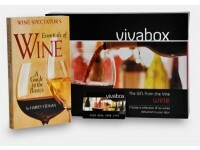 Learn more about vivabox experience gifts here. Last Minute Gifts. The Daily Grommet team shares a selection of gifts that are in-stock and ready to ship for your last minute gifting needs. Something for everyone on your list, in every price range. (Starting at $10.00) Buy last minute gifts here.